So, now for a little confession which, they say, is good for soul. Nah, not THAT kind of confession. Ha! Truth is, I thought it best to put the wedding festivities into several posts so that, a. y'all didn't have to look at THAT many pix all at once and, 2. because I have so much to say and knew it needed to be condensed. What can I say. I was the Mother of the Bride, after all. Those of you who are friends with me on Facebook can skip this post altogether or just do the reading part. LOL Those who aren't, can stick with the post or friend me on Facebook and see all the pix that I took. The photographer took 1600 photos. Yikes! Wish I had known this before I promised the bride that I would do something with the wedding photos for her. Yikes, again! Also, I want to say, again, that none of this would have come together without the hard work and brilliant planning of my BFF, Leslie. 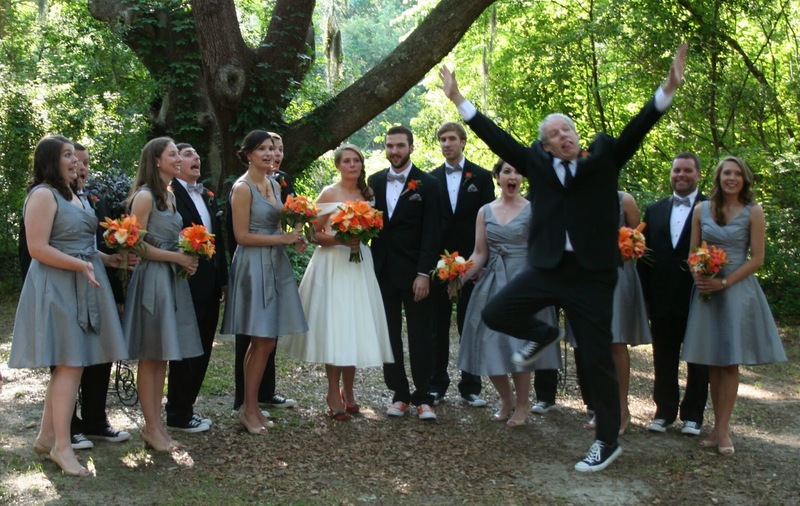 If you want a wedding in Charleston, and you want it done right, you NEED her. She pays such attention to detail and gives the bride what SHE wants not what anyone else wants. To Leslie, it's all about the bride (and a bit about the groom...LOL) and that's who she pays attention to. She can do teeny tiny to elaborate and everything in between. And she does is well. It will be perfect, just like the two she's help us with and her own daughter's wedding in April, 2013. She knows people and places so she knows who is good and who not to bother with. AND, if you need an officiant- her hubby will do it! Which was great for us since he's known Birdie since she was a wee little thing. Thank you, Leslie and Jack! Y'all ROCK! I would wait until I get the professional shots to write this post, but who knows when that will be. So- here you go. And, be forewarned, it's lengthy. 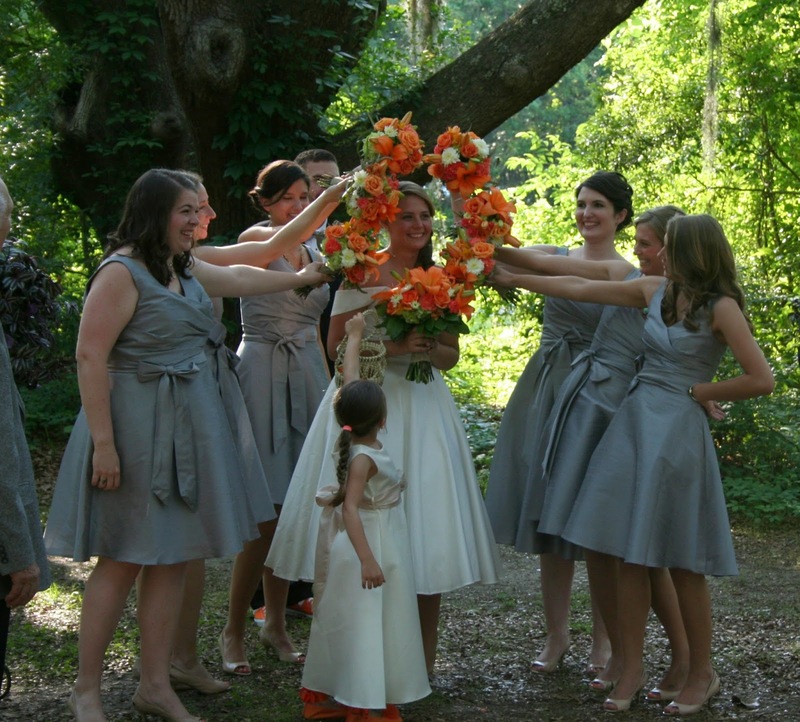 The wedding venue was Edisto Hall at James Island County Park. This bride and groom are so laid back and causal, that this was the perfect place to have their wedding. I got a cottage at JICP for the girls to stay in so they'd be close to the site and the boys stayed in one as well. The cottages are nice and the weather was as well. We never saw 80 degrees on Saturday. So nice! Everyone except the groom's sister- she has a five year old so they were running just a bit late. We might be empty nesters, but we remember those days, don't we? My dad and step-mom with Birdie. Sister of the groom, Katie and her daughter, the precious flower girl. With her orange shoes. The cake! Having a wedding in our area? I HIGHLY recommend our cake lady! She's so sweet and the cake was delicious! She incorporated a little message from her to the bride and groom on the back of the cake. The real photographer got that so I'll share when we get the real photos. Orange and gray and pretty flowers! I also HIGHLY recommend our florist. We used the same one for Breezy's wedding. I just had to get Mike, father of the groom, in a shot with the girls. He's the sweetest man and has he got humor! 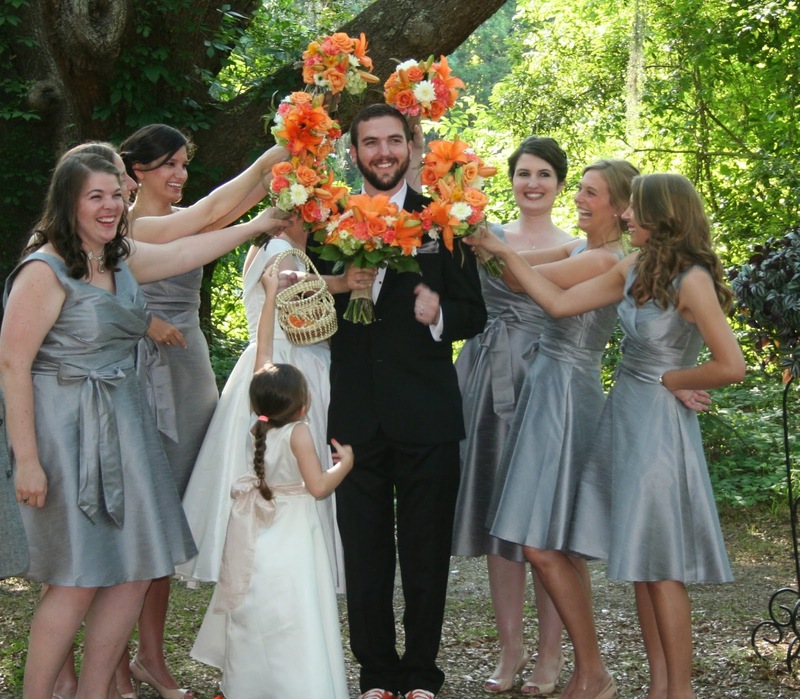 Y'all know those shots where the bridesmaids encircle the bride with their bouquets? Well, that's one thing that got a lot of laughs at this wedding. They encircled many heads with their flowers. Including the groom's father. The kiss! 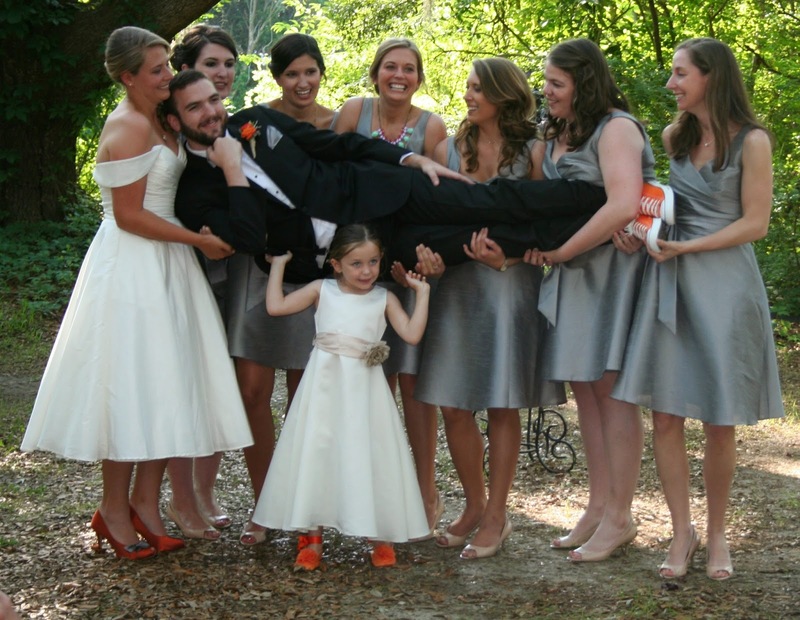 Please notice the groom's shoes. Here they are- Mr. and Mrs. at last! Since I had been taking pictures of the picture taking (haha), I decided to continue post ceremony. Maid of honor and Best Man with the Bride and Groom. The sun was shining through the huge oak during the ceremony and the pictures and it was just lovely. I have so many things to say about these friends of the bride and groom. I am gathering my thoughts and will devote an entire post on the subject. Just let me say, for now, that I have never seen such wonderful, supportive friends. These kids are fantastic! I feel blessed just to have been in their company. And not just the ones in the wedding party, every single one in attendance. How cute was this?! The flower girl ran in there to help! What a cutie! I'll share the professional pix when we get them. NOT all 1600, I promise. LOL But I wanted y'all to see some of our special day now. 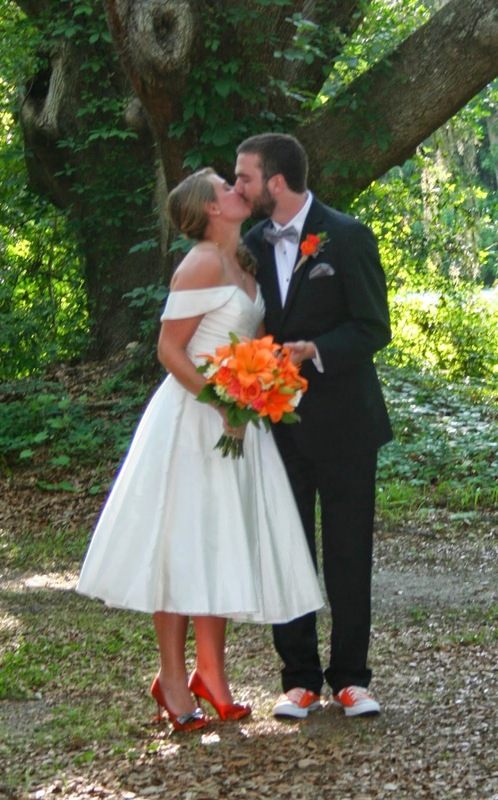 If your bride and groom are outdoorsy/laid back and on a budget, I HIGHLY recommend Edisto Hall at James Island County Park. EVERYONE at the park is nice and helpful. There's a campground right there in the park and several of our guests took advantage of this. We also secured two cottages for the wedding party which was quite convenient. They have a dog park and beautiful walking trails as well. AND, it's less than $1000 to rent the venue. WHAT?! Yep. No joke. Need a florist? Call Karen at Keepsake Florist. She has this uncanny ability to read a bride's mind. And she's VERY reasonable. I don't see us ever using a different florist for anything. Cake? Yes, use our cake lady! The cake will be EXACTLY what you ask for and the taste will be that flavor explosion that I love to experience! Cost- the most reasonable in our area. She is Janie at Charleston Cakes etc. DJ? YES! Ours was fantastic! Birdie used the same company, Jay Maxwell Music by Request, because one of her bridesmaids had used them for her wedding. They sent us a guy named Mike and he was FABULOUS! He had a big personality and enjoyed being up on the stage! He was funny, personable, a true delight! He took requests but stuck, mainly, to what the bride and groom wanted- which was perfect! I think I remember hearing that he is a high school chemistry teacher. I can just imagine how entertaining he is in the classroom! KUDOS, Mike! You were a big part of why the wedding was so much fun! Photo Booth? YES! Don't even think about not having a photo booth. Details to come in the next post! Photographer? OMG. He was great and so was his second shooter. They kept showing me things they had taken and they made sure everything was just right. I doubt they missed anything since they took 1600 pictures! I'll post his information when I am able to post his shots! Rentals. We used Event Works. They don't stand apart from anyone else we could have used. I really think anyone rental place around the area is just fine. I can say that everyone we talked with was super nice and helpful! Would I recommend them? Absolutely. YIKES! I nearly forgot the caterer. They used the Crazy Dutchman. I know they were absolutely wonderful in dealing with Birdie and that they have a very nice selection from which to choose. I also know that they are quite affordable. They showed up on time and did everything they agree to do and did it well. That being said, I thought the food was fine. Nothing great and wonderful. No great taste explosions in the mouth. But it was fine. If you find yourself here for a wedding, you're on a budget and you're not particular or not wanting gourmet food, then the Dutchman is fantastic! Pam, your lovelies are just gorgeous. I love the color of the bridesmaids' dresses. I don't think I've ever seen prettier - and of course Birdie in her wedding dress and Dorothy shoes (okay, not exactly, but reminded me). Congratulations to all of you. I agree about the photo booth, it's so much fun for the guests and a nice keepsake for the bride and groom. Better than a guest book! I loved the colors of the wedding. 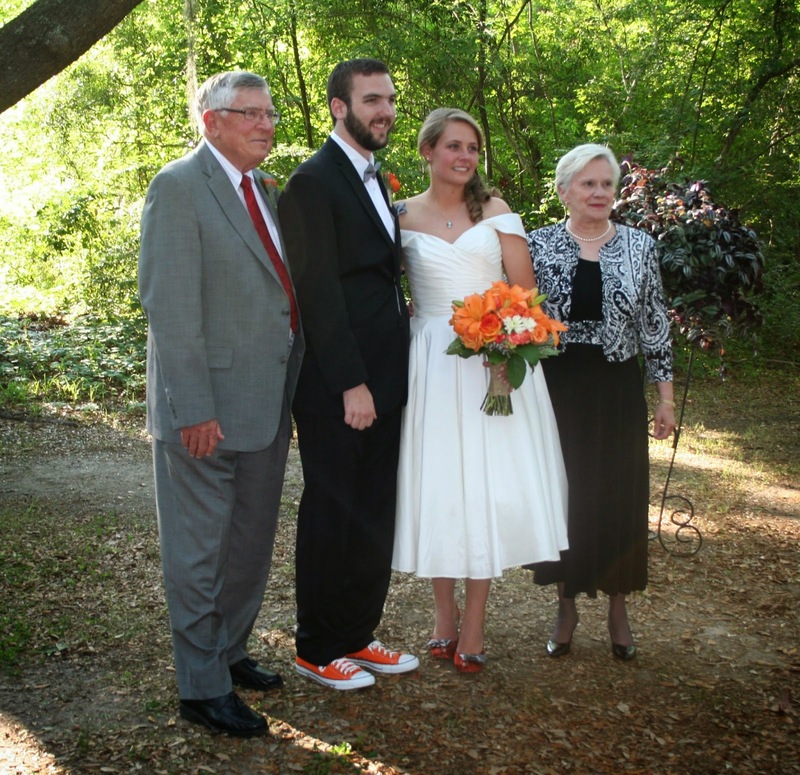 Oh and that dress, that is amazing as are the shoes both Bride and Groom. It looks like a very nice group of people. I just love looking at all of them and yes, even the 1600 :) if you wanted to show them. It looks just like a perfect day for a wedding. I love, love, love her dress!! 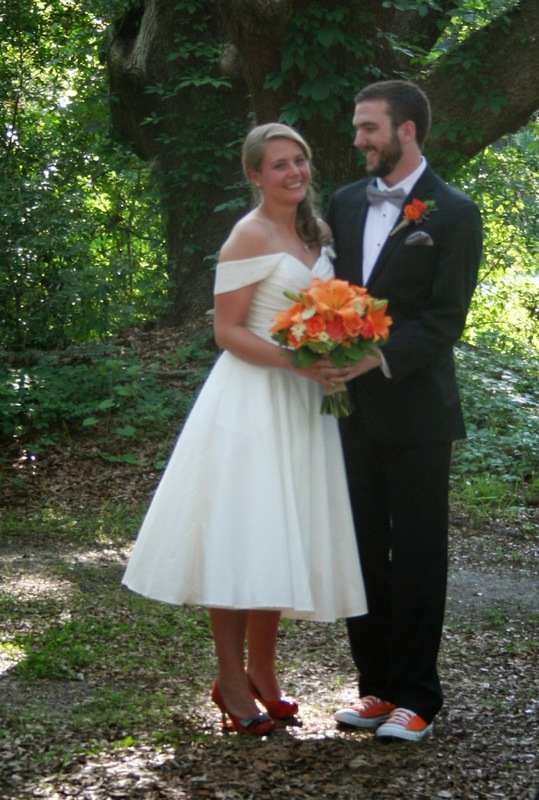 It's been ages since I saw a shorter wedding gown, and hers is just lovely. 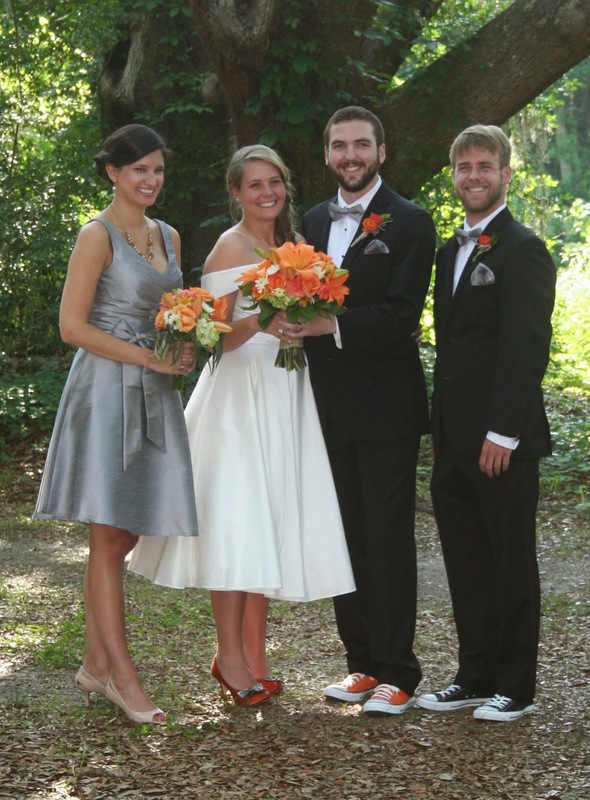 What fun, with the orange shoes - on both bride & groom. Thank you so much for sharing the photos with us, and for the commentary. I'm so glad the weather was perfect, the day was perfect...just awesome. I would love to connect on Facebook. I'll look for your link here, but you can find me (if you want to) as Terri Kelly D'Orsaneo on FB. Thanks again for sharing such a special day!!! 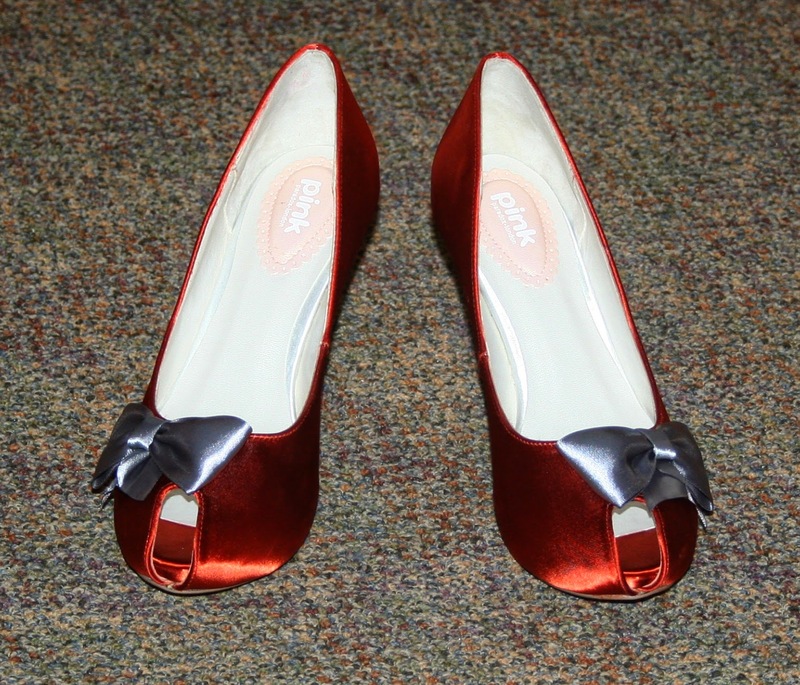 The shoes, awesome....love orange. Wow was that amazing. You all are very blessed. Think you for sharing. Judy- Thank you! We had such a wonderful time and the weather couldn't have been more perfect! Cindy- It really is! And it's all so funny! Thank you! Kim- I did too, except the color of the bridesmaids shoes but, it wasn't my choice so I kept my mouth shut. LOL I can't even think about having to go through all those pictures. 1600 is quite a lot. I'm hoping they cut it back before we get them. I love seeing all the pictures and hearing details. I say post away! It's your perogative as mother of the bride. Orange is my color, so I love love love it! The flowers are so gorgeous. Since I happened to be in Charleston wedding weekend, I will just say that weather was spectacular! Beautiful bride! Congrats to all! Joyce- The weather was more than we could have asked for! We never broke a sweat. Well, except for when we were on the dance floor. LOL I thought the orange looked quite lovely but wasn't sure at first. I'm so glad you're enjoying it! How's the wedding planning going up your way? Karen- It was so much fun! Right. I can't believe he took that many pix. I hope he weeds through before we get the disc. P.S. The special shoes were a nice touch! Debby- Thanks! I am too. It's always best when it's what the bride and groom want. Everything was absolutely beautiful. I especially love her shoes.